During a recent Fire Speaks event, Grandfather Fire spoke of the ancestors as those who came before, and how we today benefit from their work, effort, sacrifice, sweat and blood. When they see us sitting around fire, as they once did (whether around a hearth or a candle on a kitchen table), sharing our love and laughter, and also our common human concerns, they see that we are not dismissing the learning they have left us, that their work was not in vain or forgotten. 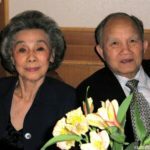 Firekeeper Mai Duong offers this honouring of the gifts her parents left her through their living example. Mai Duong lives with her husband and their 2 sons, in Toronto, ON (Canada). Besides being a Sacred Fire Firekeeper, she is also Director of Events for the Sacred Fire Community, a Plant Spirit Medicine Healer and produces Motherly Love Kombucha.